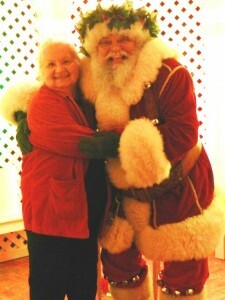 Linda Burton posting from Jackson, Mississippi – I saw the cutest Santa in the world tonight. Never before have I seen Santa Claus with jingle bells around his knees and a wreath around his head. And just look at the smile on this fellow’s face! No ordinary department-store Santa this; and no ordinary evening either. 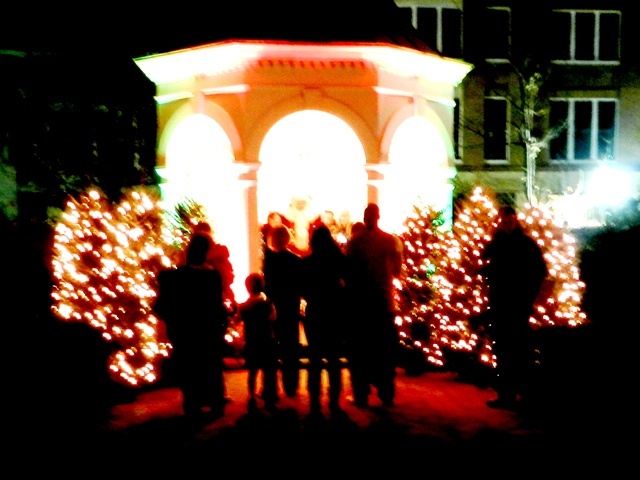 I’m standing in the gazebo in the East Garden of the Governor’s Mansion, my third stop on the “Seventeenth Annual Old Jackson Christmas By Candlelight Tour” that charmed the socks off delighted guests. 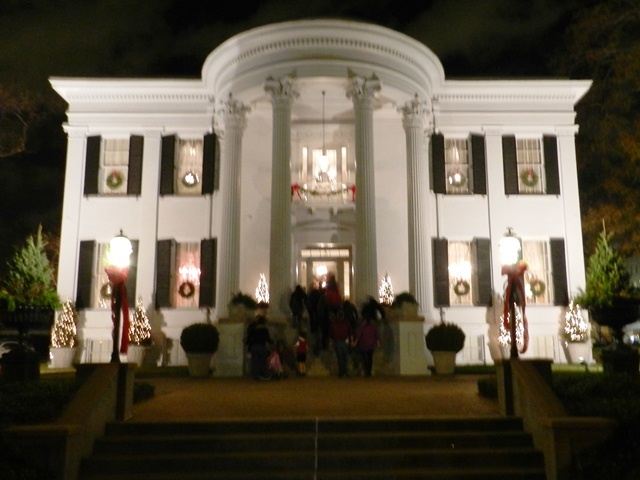 From the back steps of the State Capitol, shuttle buses ran a constant route for the four-hour soiree, delivering passengers to the Old Capitol, the Governor’s Mansion, the William F Winter Archives and History Building, and the Eudora Welty House. The buses were packed with townfolk and out-of-towner’s like me; young and old tiptoeing along candle-lit sidewalks in eager anticipation of the next surprise. A mother and little daughter behind me sang “I love the bus, I love the lights, I love everything I see,” in a self-made tune. We were greeted at every door with welcoming smiles, and, true to southern hospitality, in every place refreshments were served. It was hot chocolate and peppermint candy canes at the Governor’s Mansion, where First Lady Deborah Bryant mingled with guests during the earlier hours of the festivities. 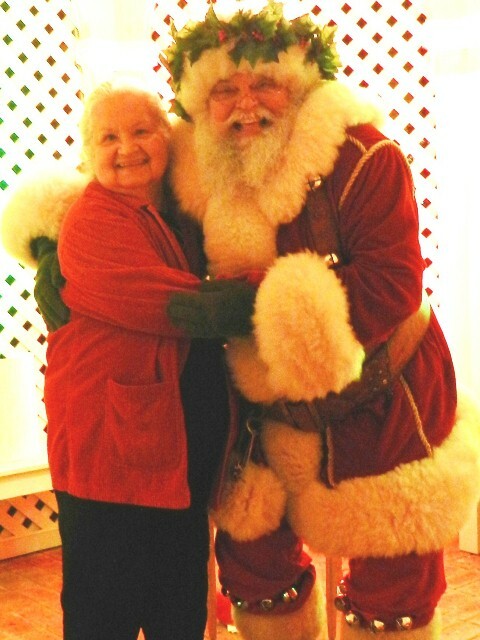 Santa held court in the garden gazebo, while docents inside the mansion gave tours of the historic downstairs and four bedrooms upstairs. No photos allowed inside, so I can’t show you how magnificent it is – it was completed in 1841 and is one of only two buildings not burned during the Civil War. You can see the original wide-planked floors; the furnishings are replicated since things were lost or stolen during wartime. But what a gorgeous restoration – crystal chandeliers to carpets and everything between. And it’s used as the residence for Governor Bryant and family. How exciting it must be to live in such a historic structure! Christmas tours continue until December 21. It was hot cider and bourbon-soaked fruitcake at the Eudora Welty House, which was my second stop; it was called “The Powderhouse” holiday party – referring to Eudora’s short story “Powerhouse” inspired by a Fats Waller concert she saw in Jackson, and the powdered sugar used in family holiday recipes. 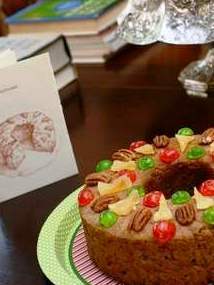 Eudora didn’t do a lot of decorating in her day and the house had the minimalist décor she would have had, but I didn’t miss the glitz; I was inspired just to be in her house and that fruitcake was really good. I’m going back another day for a slow browse-through to get the feel of a “writer’s house.” Storytime for young readers is scheduled for December 19 – Eudora was a voracious reader, you know. 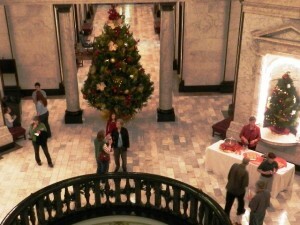 It was punch and cookies in the State Capitol rotunda, where I started my evening. I got there way before dark; the Christmas Jazz Band assembled as the crowd began to file in. 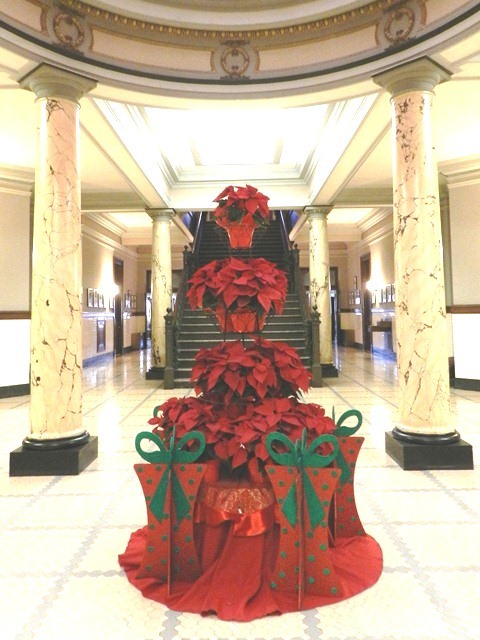 Docents and capitol staff were stationed in every crook and cranny of the massive and incredibly beautiful space; they have decorated this year with six Mississippi-grown Leyland Cypress trees, garlands, and red poinsettias. The thrill for me was walking into the House and Senate Chambers – a no-no, unfortunately, in so many capitols, where you have to peer down on your elected officials desks from on high. 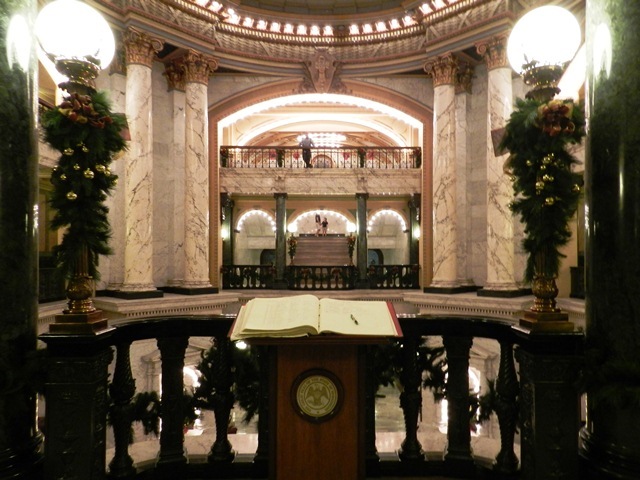 The Governor’s Office was wide open to visitors too, a lovely space with two fireplaces, and impressively – a guestbook in front of the doorway. 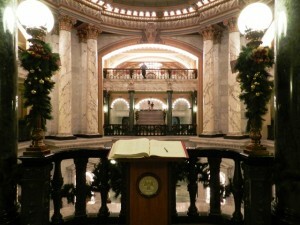 The giant pages lay wide-open, ready for all visitors to sign. “I’ve worked here for thirty years,” the security guard told me, “and it’s been there as long as I can remember.” I signed in. Greeters at the reception desk handed out lapel pins of the capitol dome, brochures about the capitol and upcoming holiday events, and a sticker proclaiming “Mississippi State Capitol.” Something to leave behind, and something to take away, an exchange of good will. My energy ran out (sadly) before I got to the Old Capitol – it was decked with greenery as it was in 1840 when the women of the town prepared the building for a visit by Andrew Jackson. I’ll catch it next week (sans refreshments! ); they have Telling Tales for school-age kids through December 20 and choirs from local schools and churches performing. 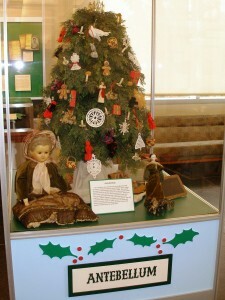 I missed the Archives and History Building too; another one to catch next week – they have model trains running in the model town of Possum Ridge (I’m a sucker for miniature villages); wish I had some grandkids here to see it too. Christmas trees in the lobby are decorated as they would have been in the Antebellum, Victorian, Depression, and post-WWII eras; the archives have a selection of historical Christmas cards to see; and vintage toys are on display.